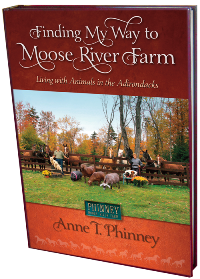 I thought it fitting to share an excerpt from Finding My Way to Moose River Farm about the end of a typical day. Before saying goodbye to the old and embracing the new I wanted to acknowledge what a blessing living here truly is. The simple act of falling asleep, knowing that all creatures are safe and sound from the barn to our bed and many places in between is one of my greatest comforts So come along as I 'tuck in' my animal family on a cold winter's night. The late evening is my favorite time to visit with the horses and goats in the barn. After dinner I have a tendency to fall asleep in an overstuffed leather chair with at least three dogs piled on top of me. Sometimes it is as late as 12:30 a.m. before I wake up and head out to the barn. While pulling on my winter ‘uniform’ that consists of a warm jacket, wool hat and gloves, the Westies, (Puppy Play), make one more visit to the yard to take care of their bedtime business. They return to the house quickly just as I am slipping my feet back into barn boots. A blast of cold air assaults my face as I close the back door behind me. This time Fiona, (No More Pigs and More About Fiona), isn’t with me. During the winter, she goes to bed early, around 4:00 in the afternoon. At that time she comes in from her last visit to the barn glistening with snowflakes that melt quickly when she enters the warm house. She heads for her crate that is in the same room where Rosemary, (Animals in the Classroom), is sleeping on her electric heating pad. Fiona gets right into her bed and begins scratching at the assortment of ripped saddle pads, blankets and towels. All of these items were once whole, but Fiona enjoys tearing them up with her strong snout and teeth. Eventually she lies down satisfied with the nest she has made. “Umph,” is the last syllable that she speaks. Soon her deep breathing signifies that she is fast asleep. When the temperature dips to bitter cold, I stop in to cover her with an extra blanket. On my way to the barn I glance up at the millions of stars that twinkle so brilliantly in the black Adirondack sky. The crunchy snow below my feet sparkles in harmony with the glowing stars. Despite the bitter cold, it is a beautiful night. At the tackroom door I stomp my feet to eliminate snow before I turn the knob and enter the heated space. The horses hear me coming and begin to whinny and nicker in anticipation of my visit. I grab several carrots from the refrigerator and open another door into the cold barn. The aisle floods with light when I flip on the switch. Then I apologize when every head sticking out to greet me squints and blinks excessively from the glare. Starting with Target and working my way clockwise I stop at each stall and offer a piece of carrot to the occupant. Next, I deliver one flake of hay to each horse as a midnight snack. Luckily, I have several buckets of water on reserve in the tackroom and use them to top off the heated buckets hanging inside the stalls. That way I don’t have to waste time dragging the hose out of the tackroom and then draining it carefully after use. For the final time today, (or first time, if you consider what time it is), I visit each stall with the wheelbarrow and a pitchfork to remove any manure produced since dinner, six hours ago. Before shutting off the lights I divide one flake of hay for the three goats and offer each of them an apple cinnamon horse treat. “G’night goaties! G’night horsy boys and girls,” I whisper on my way out the front of the barn. Light glowing from the living room windows beckons me back toward the warm interior of the house. Once inside I peel off my uniform and head up to bed. On the way I pick up our long haired Dachshund puppy, Hayden, (Finding Hayden), and turn off all the lights. “Vrrr, rdddr, frd d fr,” Hayden sighs. I carry him in complete darkness up the stairs with Nina and Niles in tow to our bedroom on the second floor. Sixteen hours ago my day began here. I place Hayden and Niles on the bed and head to the bathroom to change. Thin cotton pajamas replace my fleece riding tights and wool sweater. With face washed and teeth brushed I make my way to the bed in the dark. Climbing into the flannel sheets is a signal to Huxley, (Welcome Huxley), (who went to bed with Rod three hours earlier), to climb in with me and press his whole toasty body against my chest. Niles curls up on the edge of Rod’s pillow and above my head. Nina jumps up on the bed and pushes her way under the sheets to her assigned spot between Rod’s feet. The puppy, too hairy to find comfort under the sheets lies on his back against Rod’s leg and sighs. Good night Moose River Farm! 12 months of endless chores! 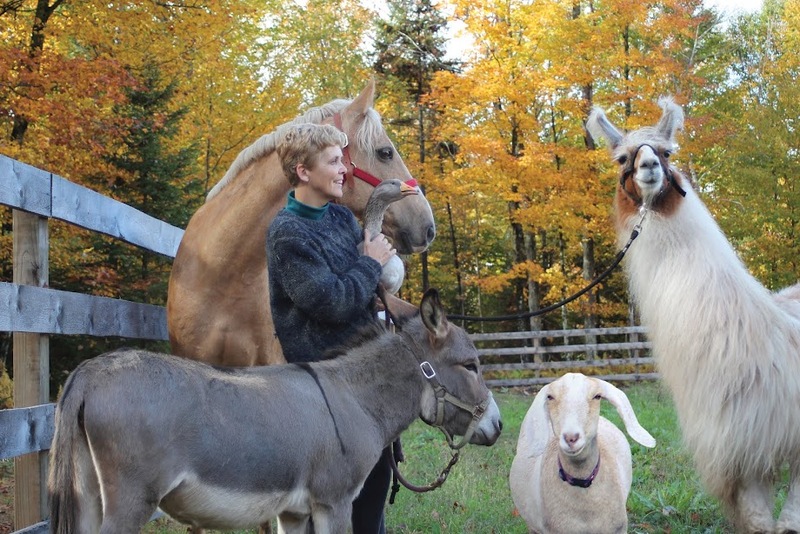 Easau, Sandi, Zambi, (that is as close as he will get to the donkeys), and Welby, Donkeys; Frank and Bing. 10 months of teaching fifth graders! 9 months of riding lessons! 8 months of good weather riding! 7 months 'til book publication! 6 months until summer vacation! A pig plowing through 5 inches of snow! ...and an iguana at the top of a spruce tree! To all our friends and family, we wish you the very best this Christmas and in the coming New Year! 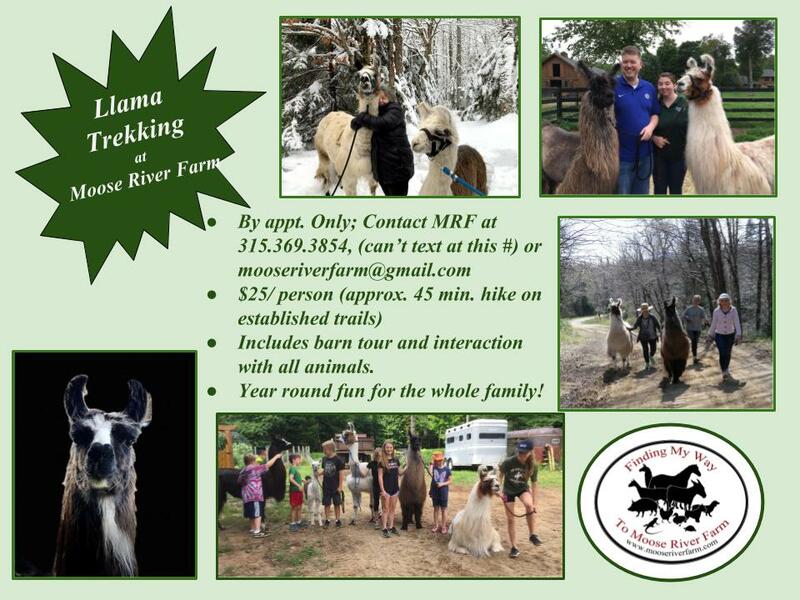 The holiday season is in full swing and in keeping with the spirit of giving, Moose River Farm has recently opened its arms and given a home to two baby donkeys. Their arrival attracted much attention over the weekend as many well-wishers stopped in to meet the tiny newcomers. Even the goats, horses and Fiona, the pig showed great interest in the tiny equids who seemed to have appeared out of thin air overnight. "Why do you want donkeys?" "What are they good for?" Not sure how to answer all of these questions, as only time will tell. So before I formally introduce you to the new additions allow me to share the story that brought them to the Adirondacks. "Aww! Reba!" came the reply followed by a chorus of sympathetic giggles. "She was so sweet! I want Reba!" The little donkey mare had made a lasting impression on me when she pushed her way passed two smaller baby donkeys to fill the space provided by my open arms. By pressing against my chest and dropping her head over my shoulder, I had no choice but to wrap my arms around her. What a love! I have no doubt that she was desperate to show me that despite her larger older size, (1.5 years), she was a better specimen than the two tiny babies competing for my affection. Her gesture won my heart. Unfortunately, the logistics of getting Reba the donkey to the Adirondacks on her way from Equine Affaire in West Springfield, MA to her home in Indiana was going to be next to impossible. Therefore, I was forced to peel myself away from our embrace and leave her with her two tiny companions. What I couldn't leave behind was my peaked interest to acquire donkeys. 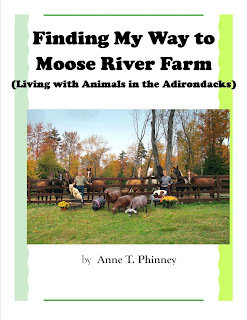 Perhaps there was a donkey in need out there who could find his or her way to Moose River Farm. Keep in mind that I was not alone in this desire. I had accomplices. Since two of them were children, two of them were mothers, and all of them were regular caregivers to the residents of MRF, I also had pressure. "It would be so cute in the barn." "I want a little baby donkey!" "Reba! Oh Reba," they chorused. For the next several weeks we joked and talked about baby donkeys constantly. Frequently, I received emails with pictures of donkeys doing the cutest donkey things. 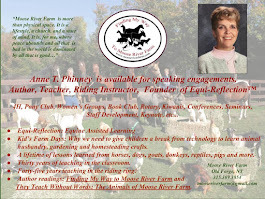 I also began casually to mention to my horse friends, connected in the industry, that perhaps I might be interested in a donkey if one became available. That is all it took. "Two donkeys available," read the broken text message from Missy, (Walking with the Animals). After an exchange of pictures and information it turned out that these two donkeys were surplus babies from a petting zoo in NJ. Thanks to Missy and another friend Mary Anne, the necessary arrangements were finalized and my two friends were finally on their way with the Adirondack's fuzziest new residents. Allow me to introduce Frank, (Sinatra), and Bing, (Crosby), MRF's miniature donkey crooners! Lacey stops by to be introduced. Lacey is naturally curious about the newcomers. Bing and Frankie in the outdoor paddock. Frankie, (7 months old), and Bing, (5 months old). My three part post about the loss of Murray and the acquisition of Makia sparked an array of thoughtful comments from readers of all ages. Many have shared similar experiences providing further proof to me that every second of life is precious and must be perceived through wisdom and appreciation gleaned. This last week was too busy, (both leisurely and professionally), to concentrate on writing, but I have compiled a number of video 'posts' that I hope will lighten spirits as the holidays descend upon us all. Enjoy! Lowtchee's arrival provided mid-winter excitement at MRF. Baby Liam and Lilly, (goats), are also featured in this vintage video. Spy Hopes was Lowtchee's babysitter for her first 'turnout' in the Adirondacks. Watching horses 'play' and interact with each other is one of a horsewoman's greatest pleasures. When the 'Westies' get together several times a year, fun is guaranteed for all!